(CNN) - A group of influential Iowa GOP donors meet Tuesday with New Jersey Gov. Chris Christie, in what appears to be another sign that many Republicans aren't satisfied with the current crop of candidates running for the GOP presidential nomination. The half-dozen or so businessmen from the state that holds the first contest in the presidential caucus and primary calendar meet Tuesday evening at the New Jersey governor's residence with Christie, whose tough talk, outspoken comments, and battles with state Democratic lawmakers over budget cuts have made him very popular with Republicans across the country, which has led to calls that he run for the White House. "We want to encourage him from an Iowa perspective and a national perspective. We need a candidate like him in the race," Bruce Rastetter, an ethanol company executive and one of six Iowans who will meet with Christie, recently told CNN in an interview. Christie has repeatedly said he is not running for the White House, most recently telling CNN National Political Correspondent Jessica Yellin that "you ain't getting me anywhere near that. My God, I am not running for president. Everyone remain calm. All is well." Yellin asked Christie the question during an education forum. After Indiana Gov. Mitch Daniels announced earlier this month that he would not make a bid for the GOP presidential nomination, a senior Christie adviser said the governor has "no change of plans" about a White House bid. 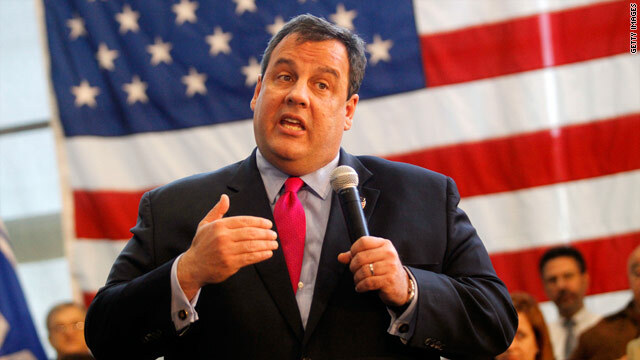 Christie said his decision was final although he did agree to meet with the Iowa Republicans. If Christie holds firm in his decision, Rastetter said it is still good for the governor to "meet people and establish those relationships." In an interview with the Des Moines Register, Rastetter added that "if we only accomplish one thing, and that is to encourage Chris Christie to maintain his leadership style and to encourage other Republicans to have the same leadership style, we'll feel very good about the trip,"
According to a CNN/Opinion Research Corporation survey released Friday, Republicans and independent voters who lean towards the GOP are split on whether they would like to see Christie run for the GOP nomination. The same survey indicated that only 16 percent are very satisfied with the current crop of presidential candidates, with nearly four in ten saying they are not satisfied with the field. But Rastetter says the meeting is not an indication he is unhappy with the current Republican candidates or thinks they are weak. "I think the other people are good people, good candidates. Chris Christie is someone who is...unique...and direct," Rastetter told CNN. "We are attracted by how he governs and addresses the issues." Christie's chief political adviser, Mike DuHaime, told CNN one major reason the governor chose to meet with Rastetter and the other Iowa activists is because they are close to Iowa Governor Terry Branstad, for whom Christie campaigned last year. Also DuHaime said knowing "other people who will be influential" in the party will be "good for the governor" since Christie "likely will be influential in the party." Christie's influence could be a major influence in the GOP nomination process. Three candidates have already met with him in hopes of winning his support. "I am going to continue to play a role as a leader in our party and I think appropriately so," Christie said in a recent interview with radio host Chris Sitgall. "I am happy to play that role if they think I can play an important part in a presidential campaign to help them and help us to elect a good Republican to replace President Obama in 2012 and clearly that is my goal to make sure we have a change in 2012." He said in the radio interview he preferred the GOP nominee to be someone who has been a governor. "When you have the responsibility to have run things and make executive decisions, I think it just trains you better to make decisions at the next level, at the federal level." I am sorry but this man is no better than Rick Scott or any other Republican that got elected in 2010. You are killing state budgets while cost jobs. You lie and spin the truth everyday. On top of that, this one in particular is a rude bully to his own constituents in his state. He would be a horrible President if he was ever elected. There's not a single republican candidaate that can tell you what his ideas are if he were elected president. All they can do is "Obama gets an F" or "Obama ineffective President". WHAT WOULD THEY DO????????? Seems like these days all you have to do is act like a complete jerk to have Republicans beating a path to your door to beg you to run for the presidency. They don't want someone with ideas, they want somebody mean. Please yes take him away from New Jersey he has done nothing but make things worse, apparently its a crime to be poor in New Jersey because you are not entitled to the same education as some one who is not.He is the Governor who ate New Jersey. Yeah, we need one more fanatical nut case in the republican field. Is there no such thing as a moderate republican these days, or is the party destined to die when the country wakes up to the destructive anti-democracy nature of these extremists. The office of the president call for on the job trainning as one General told me many many years ago unless you did the job you are inexperience.Bless. Christie has more legal troubles over his legislative policies than the Governer of Wisconsin. He cut funding to education funding that are mandated by statre law, and now he must fund them. He cut state participation in a multi-state rail system, used the federal funds for a tax cut to the wealthy, and now he must pay back those funds plus all funds spent on the construction so far on a project that is 75% complete killing hundreds of jobs in the process. It gets better. I suggest that you Google him and his policies. Putting up as a candidate is good if you like those policies, but a complete joke if you have any commone sense and believe in what is best for this country. This guy is a blowhard and has not even served one term as governor. What has he done? Who knows if his programs work? This just shows how lousy the rest of the republicans running for governor are if they have to court this guy. Talk about scraping at the bottom of the barrel. Let's see if he can get re-elected governor of NJ before we make him president. From the way I hear that is not a sure thing. Christie has displayed more common sense by staying out than by those voices calling for him to jump in. He has too many flaws, particularly broken campaign promises. He promised to protect teachers and other public workers, then once he got into office he fired them by cutting their budgets and funding a tax cut for the wealthy. His job approval rating is way down there, even lower than that of the Governer of Wisconsin. What does that tell you? The Republicans are really going out of their way to find better candidates this election cycle. Christie's number are rapidly sinking in New Jersey. he can't get reelected there. While Christie may have some talking points that may work for NJ, will it work for the Nation is the question? NJ is a state that is still in a flux and still pretty much not improving since he has been in office. Therefore, he knows it is best that he sit the Presidential election OUT!!! Ah...Christies polling is tanking in his own state, more disapprove than approve. Much like many of the other republican governors. How can they expect him to draw nationwide? This is not pc, but I wouldn't vote for someone as unhealthy looking as Christie. He's a heartattack waiting to happen. Plus, the bully mentality is a sign of intellectual weakness. I don't care for his demeanor. If Christie's name is being tossed around as a potential candidate, the GOP are in serious deep doo doo. dangle some pie in front of him and he'll dance to whatever tune you want. Good luck with that! Gov. Grasso could not even carry his own state-the man in a complete failure and an utter jerk! The only GOP candidate I fear is Christie because he can beat Obama. The goal is to put Obama out of office, not jobs, not the economy, not the budget, and "not Obama". Hope.......sound like hope. Christie can NOT beat Obama maybe beat him to the dinner table. He is not smart and he is a bully. He has destroy New Jersey that is way he is not running because he KNOWS that he can not beat OBAMA.